Council is still in recess, and Council President Garcetti remains in Florida for his service in the Naval Reserves. 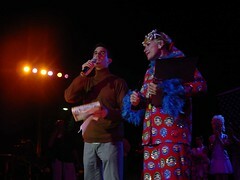 The following is a guest post by CD13 communications director Josh Kamensky. Quinceañera is a terrific document of how Echo Park's different communities overlap, interact and conflict. Chicken Corner evaluates the film from the POV of a long time Echo Park resident, pointing out that the effects of gentrification are painful, but they aren't as new as other reviewers have suggested. I won't go into a full-on review in this space (short version: I loved it), but I thought the CD13 blog would be a good place to add a minor but important detail about gentrification and city policy that didn't get picked up in the film itself. One of the twinned plots concerns Carlos, who lives with his cousin and their Tio Tomas in an apartment on the same lot as their landlords' house. After an affair between Carlos and the landlords goes sour, they move to evict the family from the apartment. What no one in the movie ever points out is that under Los Angeles's Rent Stabilization Ordinance, this is completely illegal. The family could have learned their rights and defended themselves by calling the Housing Department. Leaving out this detail didn't make Quinceañera any less realistic: Very few tenants know their rights, and many more are probably scared of exercising them. But Los Angeles filmgoers and tenants should know that although public policy can't untangle every knotty problem linked to gentrification, the city can help you fight unfair evictions. Five years ago, Elysian Valley United’s (EVU) charge to re-establish a library in their neighborhood finally came to fruition as The People’s Library opened with 5000 volumes of children’s, youth and adult literature. The library has since become a thriving center of academic and intellectual growth, providing community members young and old a like a resource to satisfy their hunger for reading and learning. 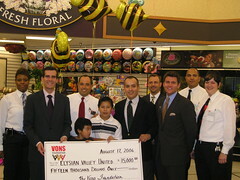 Now, it will be able to provide even more resources to the community, thanks to a $15,000 grant provided by the Vons Foundation. The funds will be used to help establish and expand a literacy program run through the library, and will go towards the purchase of books, equipment and supplies for the library. If time is money, then developers just got a way to turn being green into banking some green. The city council has unanimously approved a plan to expedite the plan-check process for buildings that conform to the “silver” standard of the Leadership in Energy and Environmental Design (LEED) guidelines. The program, initiated by Councilmember Jack Weiss and me, will allow LEED-certified buildings to move to the front of the permitting line, saving developers time and money. The LEED standards, created by the US Green Building Council, establish a set of criteria developers can implement when designing their buildings that will make the construction, maintenance, and operation of these structures more environmentally friendly and energy-efficient. Included in these guidelines are credits for using green power, employing water efficient landscaping, building near public transit, and using recycled materials during construction. Each one makes Los Angeles a cleaner place to live and mitigates the impact that urban building and urban living has on the environment around us. There are different LEED standards – certified, silver, gold, and platinum – each corresponding to an increasingly high level of environmental efficiency. Los Angeles already require all new municipal facilities to be LEED-certified, and since 2003 forty-six LEED-certified municipal facilities have been built. Today’s action will spur the private sector to join the city as the leader for green building in the country, as we work to make sustainable living in an urban setting a viable option. According to Global Green , construction and maintenance of buildings are responsible for 40% of energy use and 30% of the wood and raw materials used. Equally taxing on the environment are the large amounts of pollution and waste produced by buildings, which create local pollution, drain natural resources, and accelerate climate change globally. The LEED certification process gives developers and communities alike the chance to alleviate the negative consequences of urban life with well-thought out designs, sustainable products, and emerging technologies. By encouraging the private sector to go green, we can transform both our built and natural environment. LA’s leadership in so many areas of life is known all over the world, and as urban life in the new century continues to transform around us, becoming a LEED city will ensure that we remain part of the solution and not the problem. British authorities announced on Thursday the arrest of 24 individuals suspected of attempting to launch attacks on airplanes between the United Kingdom and the United States using a mixture of liquids that they intended to smuggle into the air. While the disclosure of this plot certainly reminds us that we must always remain vigilant against those who wish to inflict harm upon us, it also reaffirms our faith in the work of law enforcement agencies and individuals around the globe to prevent such catastrophes. 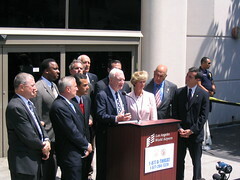 Yesterday, I joined Mayor Villaraigosa, Chief of Police William Bratton, City Attorney Rocky Delgadillo, and my City Council colleagues Dennis Zine, Jack Weiss, Bill Rosendahl, and Janice Hahn — along with federal security officials — to address local concerns that have arisen as a result of the arrests. Though the national threat level was raised to the “orange” level for the aviation sector, a state of heightened alert, all Los Angeles-area airports are fully operational, and flights are departing and arriving as scheduled. Be sure to give yourself a little extra time to make your way through some of the extra security checks, and remove any liquids, gels, or other similar items from your carry-on luggage and store them in your checked baggage. Silver Lake on Sesame Street! Building upon and adding to her ever-growing list of accomplishments, the first Queen of Silver Lake, Leslie Carrara-Rudolph is now an official character on Sesame Street! As I wrote in this space before, Leslie is known to many throughout Silver Lake for her performance of The Wizard of Oz using only sockmonkeys. She subsequently appear in Disney's Johnny and the Sprites, and has now rocketed onto Sesame Street, where she will be the first new female cast character since 1991. She will be playing the character “Abby Cadabby” beginning on August 14th, and you can see her spend her first day at school with Mrs. Goose on August 15th. In the coming weeks you can see her presenting the letter “I” with T.R. Knight from Grey's Anatomy. Congrats, Leslie! 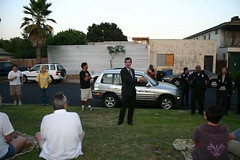 National Night Out is an annual event to build relationships between communities and police. If you didn't make it to one of the events at the police stations that serve CD13, why not take the time to figure out which police division serves your neighborhood right now? My staff and I celebrated the two year anniversary of the launch of Uniting Neighborhoods To Abolish Graffiti (UNTAG) by driving throughout the streets of CD13 and counting every single tag in the district. In 2004, we announced that our goal was to cut graffiti in half over the next two years. It gives me great pleasure to announce that over the past 24 months, we have reduced graffiti by 55%, from 20,763 tags in 2004 to 9,419 tags this year. The amazing pace of removal and abatement of graffiti is a credit to the collaborative efforts of the team of volunteer block captains who have commited to reporting tags as soon as they go up, the preventative measures that the police have used, and the quick and reliable work of the city paint out crews. What was interesting about this year’s count was the qualitative difference that we noticed as we drove the streets of the city. Graffiti has moved off of the big walls and sides of houses where it used to be, and is limited to smaller and more remote media such as mailboxes, light poles and street signs. The canvas of tagging is indeed shrinking, as taggers are getting more and more desperate. The change that we have witnessed gets to the core of what UNTAG is all about – making neighborhoods feel safer. 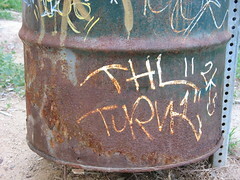 With graffiti less visible, taggers are not able to intimidate like they used to. 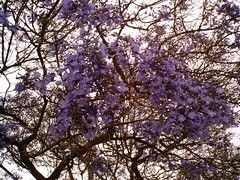 The success of UNTAG is really in the way it feels to walk though the streets of your neighborhood. Another revealing observation from this count was the success of our effort to remove graffiti at designated “hot spots.” Working together, the police monitor those areas that are chronically tagged, and our block captains have fully utilized our “rapid response” paint-out system. The success of our hot spots demonstrates the power of the community, and how important community participation is in improving neighborhoods. Click here to become a block captain today! The lotus flowers are now, gloriously, almost in full bloom, their huge satellite-receiver leaves tilting toward outer space — "they missed the Lotus festival in mid-July, a result of cool spring weather, said the LA Times. The lotus thrive in slime, which makes me worry that when the city cleans the lake — Prop O funds are earmarked for the project — what will they do to preserve the lotus bed? Will they scour the lakebed and then add new slime to replace the toxic sludge they just spent zillions to scoop out? No imported slime could be quite the same as what we have spent decades developing here at Echo Park Lake. Great point, and thanks, Jenny, for pointing out that Echo Park Lake is a high-priority Prop O project. Prop O raised half a billion dollars in bond funds to clean up our rivers, lakes and waterways through projects as mundane as funding more street sweeping to those as specialized and cutting edge as using parks to filter out contaminants. It will be a couple of years before the Echo Park Lake cleanup under Prop O commences. The entire lake will be emptied of water and scraped clean of layers of earth, removing the contamination that has settled there over the decades, including toxic metals and the like. The lotus beds will need to be completely re-planted. As the time approaches, we'll contract with a plant specialist to make sure our signature plants get no less than star treatment. Someday I'll blog about the time my partner Amy's niece fell in the water in Echo Park. Maybe I'll wait until she's old enough to be mortified by it. You will find this an invaluable website: The Bureau of Street Services' (BOSS) Urban Forestry Division has everything you need to know about Los Angeles' giant urban forest. Find out what to do with your green waste, how long before the trees on your block are pruned again, and much more. Did you know that the Deodar cedars on Los Feliz between Riverside and Western are protected as cultural monuments? Didn't think so. Ok, maybe this guy did, but the rest of you didn't. UPDATE: I was joking about city nerd in that last sentence, but it turns out he or she already blogged the Urban Forestry Division. Nice work! As I hinted earlier, Councilmember Dennis Zine and I had a great time shooting the third episode of "Flavors of L.A." in the great 3rd council district, comprising the communities of Woodland Hills, Tarzana, Reseda, West Hills, Winnetka and Canoga Park. The episode will air on Channel 35 on Thursdays August 10 and 24 at 10:00 am; and on Mondays August 14 & 28 at 11:00 am and 10:00 pm. Dennis and I visit Henri's Coffee Shop in Canoga Park (and even bang out a few tunes on the piano in Henri's adjacent jazz club, The Back Room). We make pizza at Pizza Plus and dine at top Zagat-rated Brandywine in Woodland Hills. You can download the whole Channel 35 program guide for August here.